我住在多倫多市，今年的冬季很和暖，至今還沒有雪，這款鋪滿霜雪的曲奇餅，實在能令這個聖誕佳節添上溫馨甜蜜的感覺，有冰冷被溶化之妙境，未吃已有窩心之情懷 ••• 應景之選••• thanks a bunch, Christine! Happy Holidays! Thank you for your warm greetings! Happy holidays to you too. Not chocolate and cocoa make people feel like more christmassy? Lol. Hi Christine. The cookies look really yummy. Just wondering if 低筋粉 is the same as plain flour? 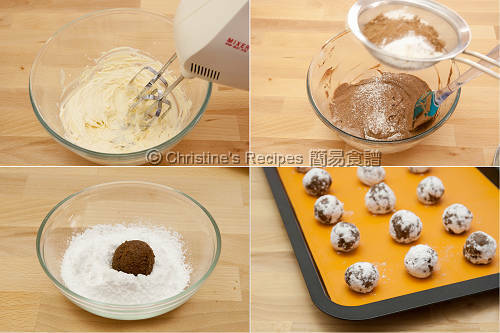 低筋粉 is cake flour, has less protein than plain flour. 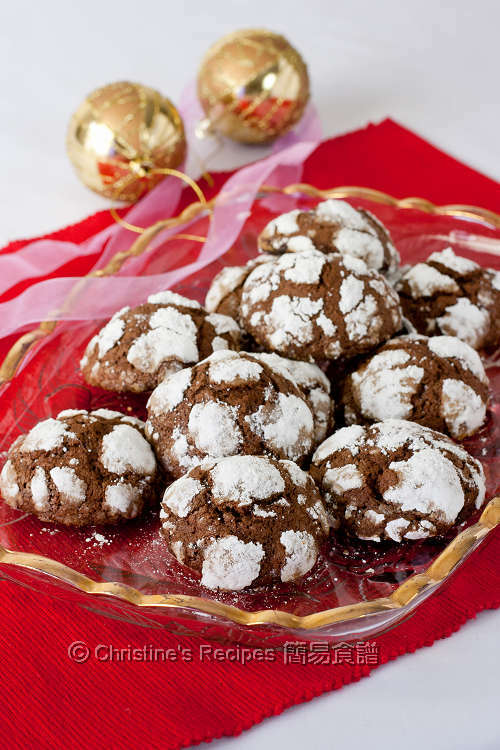 For making these cookies, you can replace with plain flour if you don't have cake flour. 請問黑朱古力若用%72的朱古力會不會太苦了, 還有可可粉可以用泡 hot chocolate 的粉代替嗎?? Can I use baking soda instead of baking powder? 可以唔加黑朱古力嗎？如果可以，其他材料的份量是否不變？好想聽日試做. Thanks and cheers ! 做法4: 冷藏過夜, 會不會太硬, 搓不成小圓球 ? 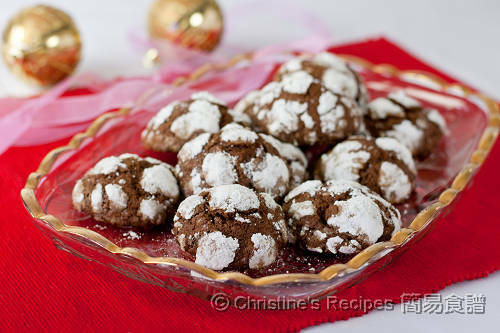 Hi Christine, 做這cookie不用baking powder 可以嗎? ......如果這是這款甜品要求, 我失敗了..我只將糖霜減少了一湯匙,其他跟足, 甜度是我可以接受的上限了, 但剛焗完出來時, ''心' 是少少軟, 覺得似食緊一個有D 實的蛋糕? ?, 放了一晚,現在個''心'' 是硬左, 似食緊''光酥餅'', 不肯定你是否食過光酥餅未?? 3) 我是搓成圓球才入焗爐, 但焗到中途約10minutes , 圓球經過焗後, 已由圓變為被壓扁的圓型了, 正常嗎?? Thank You fir your teaching! 明白，thank you so much and Merry Christmas!